The rise of collaboration tools has made email look just as slow as the old snail mail did back in its early days. Nowadays, team efforts, mobile devices and the need for flexibly available workforce (often home-based) made collaboration tools an essential component of any business effort which relies on cooperation, speed and keeping team members up to date with any development. 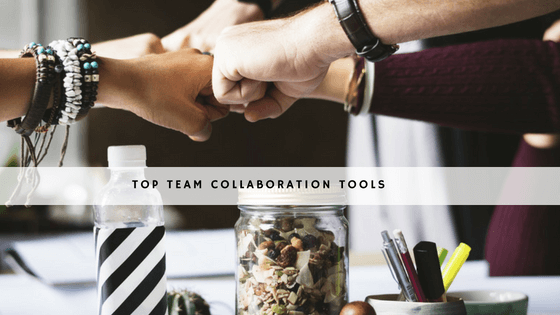 While stressing collaboration by their very name, these tools are just as excellent platforms for people who prefer to work on their own, as they make it easier to fit an individual’s output into the larger business puzzle at the end of the day. All of this makes it worthwhile to give you the hottest in team collaborations tools on the market and make your selection process easier and better informed. 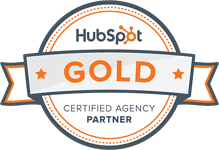 Asana is particularly close to our hearts, as it is the collaboration tool we use in Bold (though we know most agencies go for slack). Sentimentality aside, it’s really a great tool as it allows us to customize projects and task fields at a pretty granular level. For example - a sophisticated editorial calendar keeping track of different clients, different types of content and different stages of editing (from content writer draft to client approval and all in between). Asana is all about staying up to date with the projects you work on - you can organize them as a list or a board, all the while enjoying streamlined communication between all of your team members. Asana covers all bases in terms of the features on offer, ranging from task assignment and prioritization to calendar management, all neatly packaged as part of user-friendly and eye pleasing interface with project templates. With this intuitive interface, you can easily design task lists for all of your projects, while the search function is something you’ll be grateful for once the number of these projects starts growing. 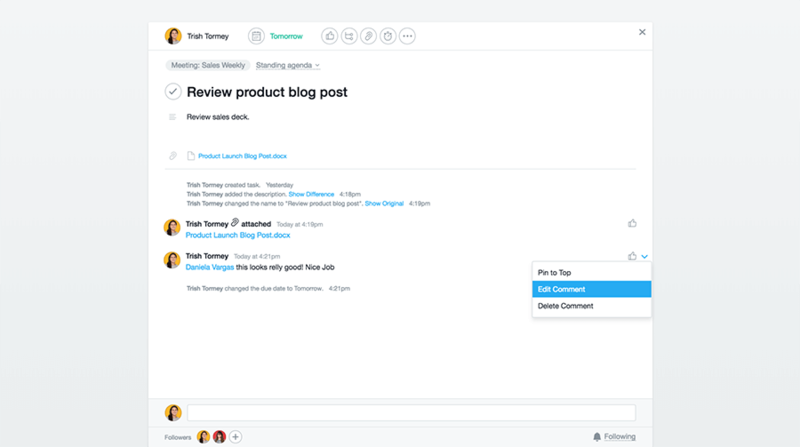 With Asana, you can also set deadlines and announcements for team members who are also able to leave comments on whatever is posted as part of Asana’s workspace. 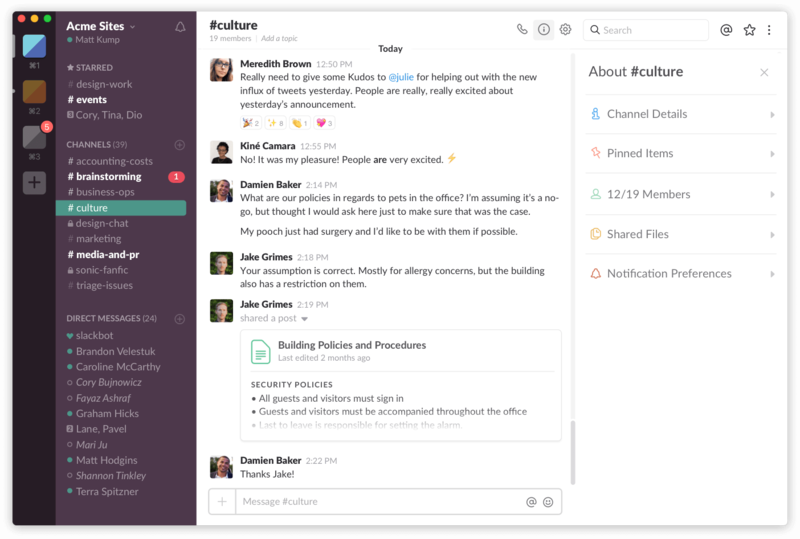 Slack is often called the big daddy of all collaboration tools, not just on the grounds that they started it first, but because of the number and robustness of its features. 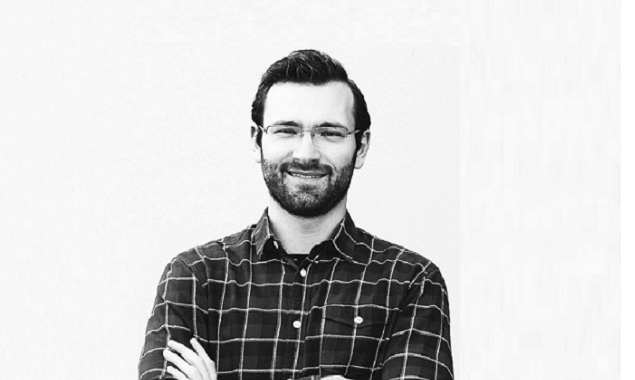 Just like Asana, it offers support for both desktop and mobile platforms. It provides a solution for direct communication between both individuals and groups of team members by means of instant messages as well as by increasingly popular video calls. Layering and organization of all tasks and human resources is easier with Slack’s conversation organizer which creates custom channels for all of your communication needs. These can include communications with people involved in specific projects only, conversing with team members in charge of specific fields (for instance, HR, IT support etc.) as well as casual chat. To round things up, Slack can be integrated with Dropbox, Google Drive, Box and other popular services. We tried using it internally and have opted for Asana but we use slack with some of our clients and it’s pretty cool. Despite having an interface which draws comparisons with solitaire, Trello is a full-blown solution for users who prefer getting the job done without all the bells and whistles of competing project management platforms. 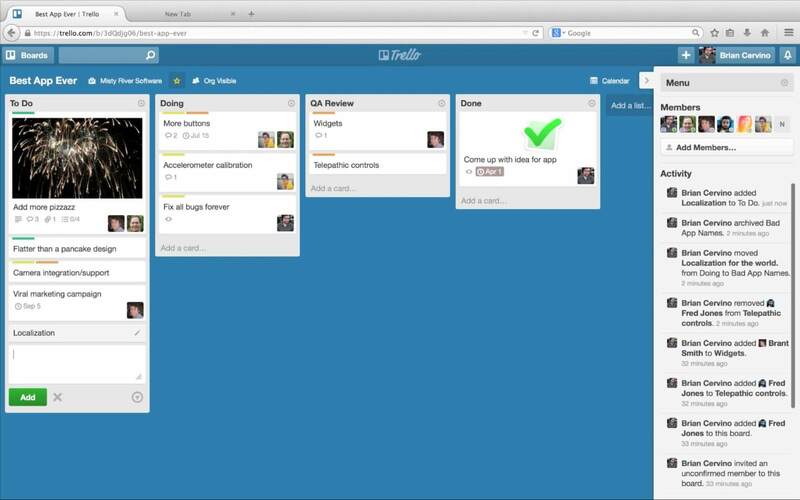 Trello operates as a noteboard, with team members’ tasks being organized like cards which you manipulate freely by dragging them between the lists you can create based on their level of completeness. Yes, it’s that simple, and both boards and lists can be divided based either on assigned persons or individually delegated tasks. Feedback between team members is shared by leaving comments on cards, with provided support for various emojis. In addition, Trello can be integrated with popular apps such as Slack, Google Drive or Evernote. The free option is a bit limited, but it can hit just the right buttons with smaller teams. Not bad for a “solitaire”, right? Good old Google has its own horse in the collaborative tool race and it is its reliable G Suite platform. The suite includes support for Google Docs, Sheets and Calendar as well as Google Hangouts platform. It supports everything a team may need, such as SMS and instant messaging as well as video conferencing. All of these features can be accessed as built-in Chrome extensions, together with native support for Android and iOS. Hangouts is easily integrated with Google Drive and other applications provided by Google. It comes with a cloud-based chat platform which makes it possible for users to share calendars as well as all types of documents among team members in real time. The same goes for sharing files on various platforms, such as desktops, tablets or mobile phones. Business users will also appreciate embedded data loss feature for Google Drive and Gmail which is a part of its Enterprise edition. In the face of strong competition, Podio wants to beat its competitors by focusing on customizability and excellent mobile platform support. So, instead of offering you a fixed set of tools the developers think you may need for collaboration, Podio gives you what is essentially a sandbox environment in which you create your own tools and customize your workflow. You achieve this by essentially making your own apps within the platform. You can both organize and give name to various work stacks, in addition to distributing tasks among team members. Podio offers quality communication features, which function well paired with its highly customizable and modular interface. It will give you a comprehensive overview of what goes on with your projects, as well as of any feedback given in relation to its individual stages. 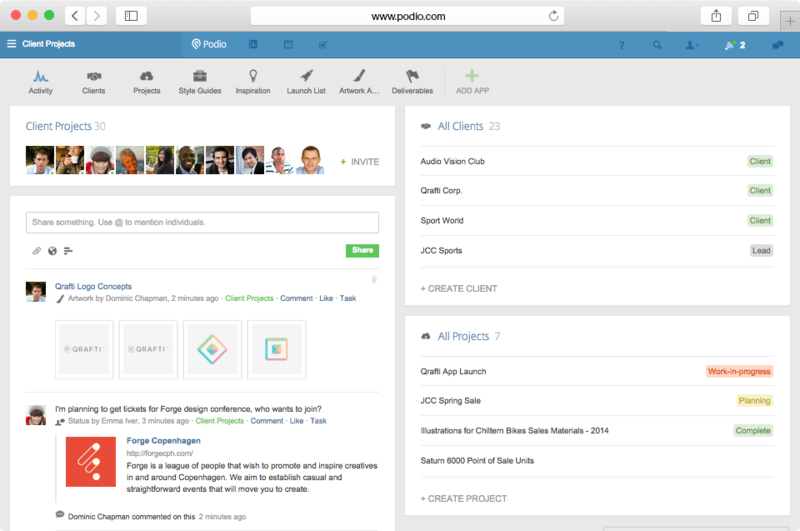 Podio can be integrated with Evernote, Dropbox and Google Drive. Flock posits itself as a fiery and more accessible competitor of the hugely popular Slack. For starters, it gives no ground when it comes to offering the same features you would expect from better established players in the market. These include audio and video calls, text chats and screen sharing, as well as the ability to set projects, teams and tasks according to your deadlines and workflow. Flock includes standard collaboration tools, with features such as team member tagging in comments, creation of to-do lists and support for uploading and sharing of documents, image-based or video files. Group discussion is also supported, together with the ability to set deadlines and related reminders, as well as sending email alerts. Finally, Flock promises to get any task done just as well as others (or even better) at a highly competitive price, which is no small consideration in planning for its purchase.